In central leader training, the dominant upright branch (trunk) is promoted and other branches are allowed or forced to grow at an angle from it, somewhat resembling a Christmas tree. Except for dwarf apples, the leader is terminated at a certain height to prevent it from getting too tall. The length of the leader varies with different tree species. Apples, pears, and pecans tend to have dominant central leaders and long-lived fruit spurs, characteristics that lend them to the central leader system. Walnuts, chestnuts, pistachios, persimmons, figs, and pomegranates are often trained to a modified central leader. After several (3 to 5) main lateral branches are developed, the leader loses its dominance and is allowed to develop similar to the lateral branches. Pruning the mature tree involves mostly thinning cuts to allow light to penetrate to lower fruiting wood, although the height of fruit trees should be kept to a height at which fruit can be picked. Nut trees do not need to be topped. 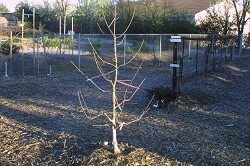 Dwarf apple tree being trained to a central leader at the Horticulture Center. Notice the limb spreaders.